This is going to be Election Year. With both the President, in his opening of parliament speech this week, and the Prime Minister repeating the desire to hold simultaneous polls, it is clear that this is what the government really wants. And if the BJP wants, it can be done in 11 of the biggest 17 states without resorting to any constitutional amendment. All the BJP needs to do is to call for a December 2018 general election, when three big states (Madhya Pradesh, Rajasthan and Chhattisgarh) have polls, get a few other BJP states to ask for early polls, and then the Election Commission will probably use its prerogative to call assembly elections in the three states (Andhra Pradesh, Odisha and Telangana) that voted for their governments along with the 2014 general election. The BJP has never made a secret of wanting the NDA to have a two-thirds majority in the Lok Sabha and control half of the states so that it can amend the constitution at will. Its key supporters have already launched Mission 360+ as a sequel to its highly successful Mission 272. 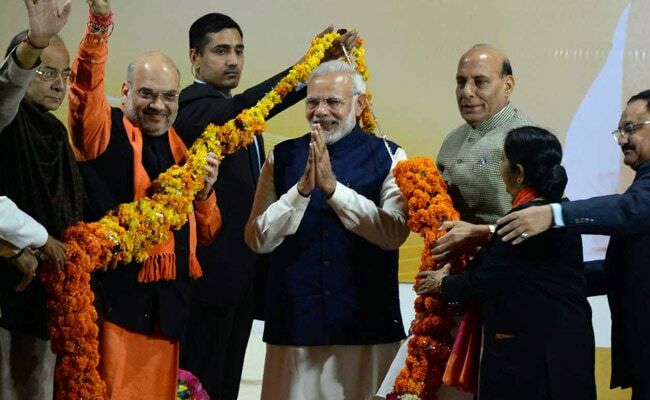 Amit Shah, the BJP President, was reportedly planning for a simultaneous election campaign as early as August last year before the tense situation in Gujarat forced him to focus on his home state. But to get to 360+, the BJP needs everything going for it, especially protecting the majorities in every state that it holds. And that's where going for an early general election and as many assemblies as possible makes sense. Karnataka will kick off the big states poll this year in April; the BJP did well in the Lok Sabha election, winning 17 of a total of 28 seats, and is trying to defeat a Congress government. But the BJP's real fight lies in Central India. 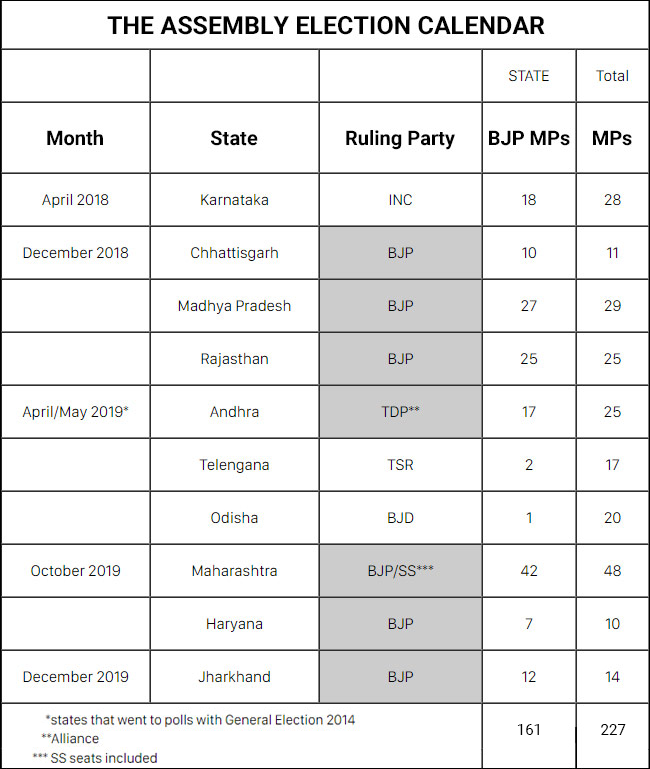 Three major BJP strongholds are going to have assembly elections in December this year - between them, Madhya Pradesh, Rajasthan and Chhattisgarh last elected 63 BJP MPs - that's just under 25% of the party's strength. All three of these state governments suffer from huge anti-incumbency issues, including a big farmers' agitation in MP, Jat and Rajput agitations in Rajasthan, and continuing Naxal violence in Chhattisgarh; all of that is in addition to a perception of high levels of misgovernance in all three states. If these three states were to vote in December without a national election, there would probably be a repeat of the Gujarat scenario (tougher fight than BJP would like) with one major difference: none of these are the PM's home state and he can't appeal for "Gujarati support for a Gujarati". Local issues would dominate the campaigns and the personalities of the current incumbent Chief Ministers would play a more important role than Modi or central government policies. And, unlike UP, it would be the BJP defending its record which strips the PM of the chance to promise huge change; the campaigns would have to stress "you never had it so good". But in a country where progress is slow, that's a hard sell and the chances of slipping to defeat in one or more of them are not low. Losing a state or more is not an option for the BJP. In these three states, it's a straight fight with the Congress and any defeat would be a big morale boost for the Congress and could help in cementing -support from other opposition parties, especially in UP, which - with its 80 seats (73 with the BJP+ currently) - decides the winner of the big national election. Furthermore, it always helps to have a state government that is your own when there is an election. The Modi factor is the most important election weapon the BJP has and simultaneous polls will allow Modi to make the campaign about himself in states like Madhya Pradesh, while deflecting from the BJP state government's shortcomings. It will be a campaign that will revolve around one major issue: who does the state want as PM, Modi or some rag-tag opposition bunch which may be led by Rahul Gandhi? Modi is a campaigner par excellence and unbeatable at showing that he is being victimized, playing up the persecution card and that only he can save India; the results are probably a foregone conclusion if he gets the chance to take this route with simultaneous polls. Also, the vast majority are unlikely to split their votes when voting for the party at the centre and the party in the state in the case of jointly-held elections. Which is why the BJP will be very tempted to add its other states to the mix. In Maharashtra, besides farmers' issues and Dalit anger, it is facing a challenge from its own ally, the Shiv Sena. The BJP-Sena partnership swept the Congress-NCP out of their sugar-mill-coated havens and if the Shiv Sena were to go separately in the assembly elections, then the BJP would hurt. Better to risk an early state poll with the general election and hope that Modi's charisma carries the day. Similarly in Haryana, only a combined election could save the non-functioning Khattar government. The coup for the BJP in calling a general election in December is that it would give the Election Commission the chance to invoke the 6-month clause. What is this? Well, it can legitimately claim that it cannot do two elections (national and state) within six months. So Odisha, Telangana and Andhra Pradesh, due for election next year, would be advanced for voting to December too. The last two may not be really that averse to it, since in Andhra the TDP is already (despite some noises) tied to the BJP apron, and in Telangana, the TRS is not averse to the BJP and may even consider an alliance. Odisha especially is ripe for BJP inroads given the long incumbency of the Patnaik regime and the recent noises from Jay Panda, the suspended BJD MP. From the point of view of the opposition, having simultaneous elections would be far from ideal. Given the financial resources of the Congress, they would find it difficult to match the money muscle of the BJP in an election double-header. In fact, for them, a victory or two in December standalone assembly elections would help fill their coffers before the big fight in 2019. Keeping the Congress poor would be another potent reason for the BJP to gun for simultaneous polls. 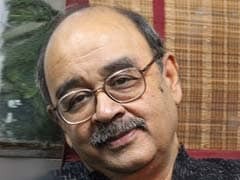 The Economic Survey has hinted at an election (populist) budget and Arun Jaitley's speech tomorrow is likely to sacrifice some fiscal prudence by showering rural India with so-called benefits for farmer, and encouraging employment-intensive industry over capital-intensive industry, giving tax sops to the middle-class and generally trying to make everyone happy. The BJP will secretly be hoping that the monsoon is good and oil prices don't go up any further which could ruin the perfect run to another great election victory in the winter. Finally, there some who argue a snap election after this budget in the summer, along with as many BJP states as possible, would be a brilliant strategy as the ruling party has money and the opposition is divided and broke. On the negative side, the last time the BJP called an early poll under Vajpayee, they lost. But Vajpayee is no match for Modi as a campaigner. And Modi is a man who is willing to take risks. I'm betting on him letting loose the great election tamasha in 2018.